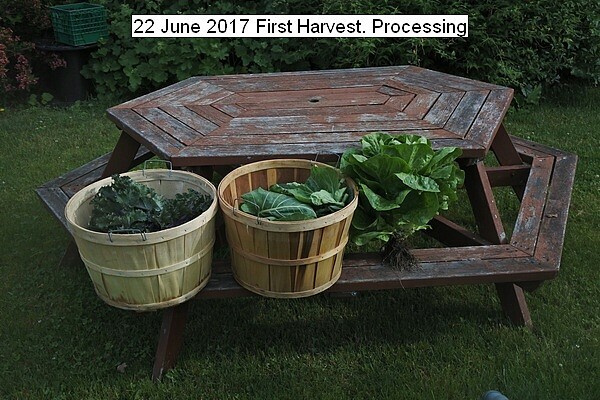 First produce (Kale,Collards,Romaine lettuce) from the garden for 2017 was harvested and processed into ten liters of slurry/juice. The lower leaves of the kale and collards were removed, and the Romaine was used whole. Quantity was 2 pounds of kale, 4 pounds of collards, and 4 pounds of Romaine. The material was washed cut into small pieces, about ten liters of water added and cooked until soft about 20 minutes. The cooked material was hand blended into a slurry, strained through a food mill of 2 mm mesh. Then the residue of the food mill was put through a Champion Juice to extract maximum nutrients. The processed juice was pressure canned in batches of seven at 15 PSI for 15 minutes for long term storage at room temperature. This is my main preserving method for all fruits and vegetables. Durgan, forgive me if this has been discussed in other posts... do you feel that the nutrient value after processing is still relatively high, i.e. not much lost in canning, or more of a 'better to have some than none or store-bought' type of thing? Probably both, plus "I grew it so it's cheap" as well, lol, but just wondering as to taste vs freezing it. I observed the freezing route and found most of the frozen produce is not used, since freezing plant produce is usually canned mush, hence not particularly appealing. Vegetables and fruit do not take kindly to freezing. For years I bought or grew some fresh and blended it raw on a regular basis. Since I started pressure canning in earnest, it was determined IMO that the preserving method is far superior to raw. The nutrients are still there and more readily absorbed by the body. Raw is not always available. I can about 500 liter jars which last me from season to season. I found it is possible to can any fruit or vegetable into pressured canned slurry/juice and mix and match without getting tired of ingesting on a daily basis. The store bought juices are simply colored fortified water. All the fiber is removed and additives are used. My slurry/juice is the pure produce with absolutely nothing added. The only discard is a minute amount of gross cellulose. Most fiber is microscope not the cellulose, which should not be ingested. There is obviously some loss of nutrients by any processing, but pressure canning can hold its own compared to other preserving methods. Almost all vegetable have a sort of benign taste, which can be readily adapted to by an individual. Fruits usually retain their accustomed taste. Juice/slurry is by no means my only food. I am always looking for other suitable healthy food. Examples being tempeh, seitan, anything fresh, dried grains, dehydrated powdered vegetables, etc. I use dairy, eggs, little meat. No added sugar except for a bit of molasses on my morning gruel. My behind the scenes is the FAST diet. I enjoy your harvest log, but find your method of juicing everything a bit curious. What is a typical dinner at Durgan's house? Meals are simple. Am eating breakfast now. Have a bowl of gruel previously cooked mixed with frozen peas previously cooked with milk and a bit of molasses. Microwaved. A piece of tempeh. A glass of weak coffee with a tablespoon of nutritional yeast. Five minute time.